Don’t give up on your email campaigns. If you feel frustrated by low click-through rates, keep one thing in mind: people tend to respond to emails at a higher rate than any other marketing channel. It is possible that you just need to make a few adjustments to the emails you are sending to enjoy high open rates, high click-through rates and more sales. 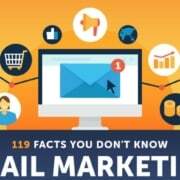 Most businesses have disappointing open and click-through rates for their email campaigns. However, email marketing is as good as everyone says it is. You just need to approach it the right way. But first, let’s take a look at the wrong way. There are two possible reasons no one is reading your emails. The first reason is that your email isn’t relevant or compelling. I like to call this the shotgun approach. Back when email services were less sophisticated, sending lots of emails was a surefire way to get attention – but that’s no longer true today. Your customers’ email inboxes are overloaded with emails they never read. If your content hasn’t been particularly relevant and compelling, your subscribers have probably forgotten who you are and why they ever signed up to receive emails from you. Sooner or later they will mark your emails as spam or just unsubscribe. The shotgun approach is exactly like closing your eyes, counting to twenty, and firing a shotgun in the air, hoping to down a pheasant. It’s ineffective and can be dangerous. Email campaigns are the same way. Emails cost your business money. Your autoresponder service costs money, and it costs money to pay the staff who write your emails. Like any other business expense, there should always be a positive return on investment. This is why every autoresponder service gives you open rates and click-through rates on your emails, as well as many more statistics for your analysis. 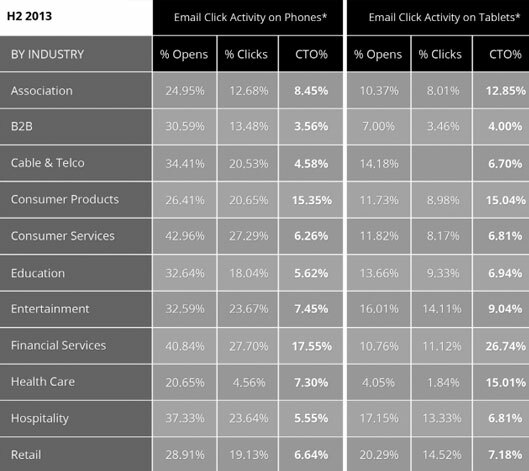 Click-to-Open (CTO) rates by industry. Most autoresponder services charge according to how many email addresses are in your lists. GetResponse’s autoresponder service, for example, charges $45 per month if your lists have 5,000 email addresses and $15 if you have 1,000 addresses. This tiered pricing system is used because larger lists consume more resources than smaller lists – and that’s where we need a change in perspective. Most people will tell you that a bigger list is better, but if 4,500 of your 5,000 subscribers haven’t opened an email in the past six months, they are dead weight. Even worse, they’re costing you an extra $30 per month with a negative ROI. However, there’s some good news. Properly targeting 500 active subscribers will yield you a much higher return than shotgunning 5,000 non-readers. You don’t need a massive list to get results – you just need to understand your audience and give them value. If your email marketing is limited to a once-per-month newsletter, you probably aren’t being very effective. As I mentioned previously, your subscribers get a lot of emails in their inboxes. Once-a-month probably isn’t enough frequency to stand out. If you want to learn how to install a successful drip campaign and start converting more with your email, Conversion Scientist has you covered. So, let’s say you’ve found yourself with a high percentage of non-openers – how do we fix it? The first step is looking closely at the subscribers who are not engaging with you. How long ago did they sign up? Their needs might have changed if it was more than a few months ago. Do their email addresses have anything in common? Your emails might have been running afoul of one service’s over-aggressive spam filters. Do the names have anything in common? Perhaps they speak a different language from your own. Is your writing style turning them off? You should be looking closely at your communication style in any case; perhaps you can bring these people back on board. If you are selling diapers, child car seats or other child-related items, then these subscribers might not need your products because their children are older than when they initially subscribed. The same is true if you have a seasonal offering or anything targeting a specific stage in life. Do you have other products that they might now be interested in instead? Could you set up a joint venture with another company that sells products aimed at the parents of older children? There are a lot of ways to monetize an email list, so don’t put yourself in a box. Your subscribers might have more children planned or on the way, so your products might still be relevant: You might just need to re-engage these subscribers. Your email automation service will have spam-scoring tools that you can use to judge how likely your emails are to be marked as spam. You need to compose a few different test emails with very low spam-scores to send to a sample of this group. If your emails have particularly enticing subject lines and special offers you might be able to persuade these subscribers to white-list you, so your future emails will get through to their inbox. Sometimes, dealing with spam or the dreaded “Promotions” folder is as simple as periodically asking your subscribers to white-list your address. Do you offer emails in alternative languages? Might it be worth considering this option? Yes, there is a translation cost involved, but translation services can be acquired extremely cheaply with sites like Fiverr and others. Are your prices available in multiple currencies? While it’s true that most credit card companies will convert transactions automatically, your customers may be put off if your prices are only in US dollars. Are your postage rates to foreign countries as low as they can be? Check around for new postage options that might have become available since you last checked. This is something you should be working on anyway in order to improve engagement with the people who have been opening your emails regularly. Refine your style with your active fans and see what they want. Make it more personal, adopt a unique voice, improve subject lines or use responsive email designs to accommodate subscribers who are using tablets and smartphones to open their emails. Once you notice engagement rates improving send out a few test emails to some of your inactive subscribers. Have you checked your autoresponder statistics recently? Do you any other suggestions for trimming your list or reactivating inactive subscribers? We’d love to hear. Share your ideas in the comments section below. Jacob McMillen combines website copywriting with clean web design, giving small-to-midsize businesses the high-converting websites they need to make meaningful online profits. Mostly good suggestions but need to be put into context. There is no point adopting a ‘unique voice’ in your emails if it doesn’t match the style of the rest of your communications, your website and customer service style. It will just sound inauthentic and grate on people’s nerves..
Yeah, that’s absolutely correct. The point is more that people are often afraid to be anything other than formal with their marketing tone. A personal tone or unique voice, consistently distributed across one’s entire marketing campaign (as you mentioned), is much more appealing.